A more comprehensive list of fake news can be found at the Daily Dot. We know that the creators of fake news and fake news sites check verified news sources. They use facts from these verified news outlets and layer it with misinformation to confuse the reader. When confronted by both the fake news and verified news, people tend to discount both the misinformation and the facts. That's the power of fake news. Additionally, most adults use social media to get their news. Columbia Journalism Review reports that 30% of fake news can be linked back to Facebook while only 8% of verified news is linked from Facebook. 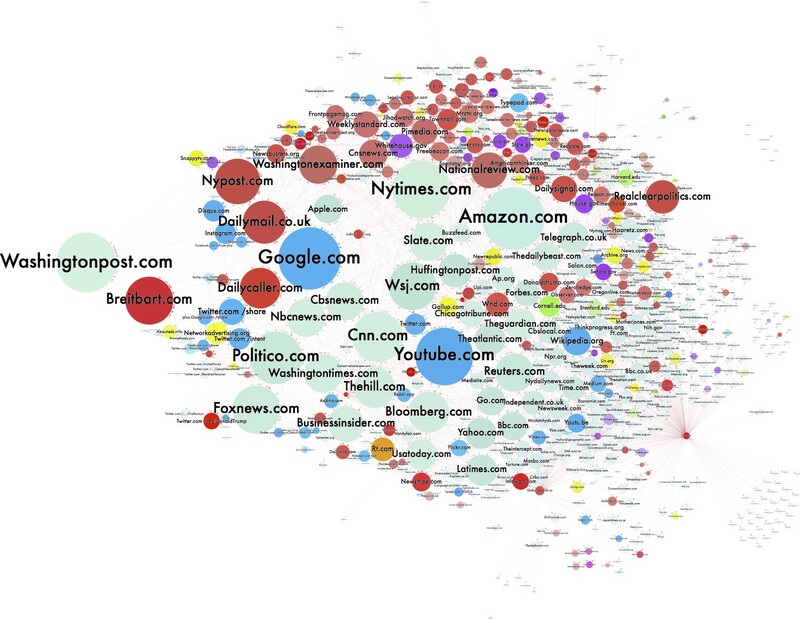 There are fewer fake news sources than verified news sources but with social media, their reach is that much more pronounced. How do we handle Fake News? By the end of this talk, there will be 864 more hours of video on YouTube and 2.5 million more photos on Facebook and Instagram. So how do we sort through the deluge? At the TEDSalon in London, Markham Nolan shares the investigative techniques he and his team use to verify information in real-time, to let you know if that Statue of Liberty image has been doctored or if that video leaked from Syria is legitimate. Circulating Ideas: Why Do We Accept Fake News? Circulating Ideas podcast with Psychologist Laura Lauzen-Collins, professor at Moraine Valley Community College, about how and why our brains are wired to accept fake news. Take Action and combat Fake News! Here are 6 ways you can make a difference NOW by evaluating and engaging. 1. Think before you share. Read the entire piece before you decide whether or not to share. 2. Verify an unlikely story. Check out some of the tools listed below. 3. Install B.S. Detector, a browser extension that identifies stories from sites that produce clickbait, fake news, and other suspect stories. 4. Help debunk fake news. Join the Digital Polarization Initiative. Report fake news on Facebook. 5. Rethink your news diet. Expand your information network to include diverse perspectives from quality sources. 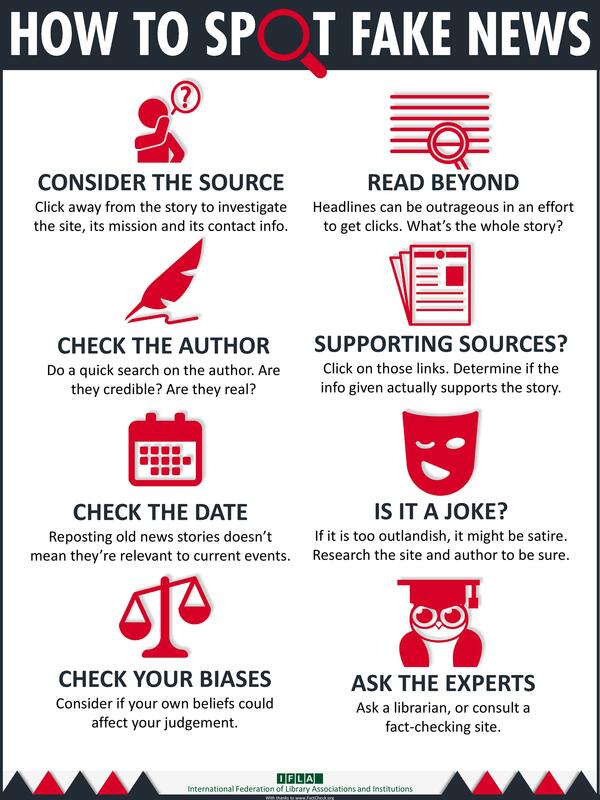 Verify, cross-check, and compare content you see online to avoid spreading "fake news." FactCheck.org fact-checks claims made by presidents, members of Congress, presidential candidates, and other members of the political arena by reviewing TV ads, debates, speeches, interviews, and news releases. Politifact fact-checks claims by politicians at the federal, state, and local level, as well as political parties, PACs, and advocacy groups and ates the accuracy of these claims on its Truth-O-Meter. Snopes.com was originally founded to uncover rumors that had begun cropping up in chain emails and message boards and is now highly regarded for its fact-checking. Handbook is a step by step guide for verifying digital content initially created for reporters and emergency responders. Web archive that captures websites over time and can be used to verify content history and edits. Identify parts of an image that may have been modified or “photoshopped”. Upload or use a URL image to check the content history or to see similar images on the web. Identifying the location of a suspicious photo or video is a crucial part of the verification process. Upload or enter the URL of an image and view its metadata. Upload or enter an image URL to the search bar and see a list of related sites. Has plug-ins for your browser. Crowd-sourced version of Google Maps, featuring additional information.